2330. B North Fairfield Rd. ticket includes BBQ buffet, beer tasting, live music, all for a great cause! 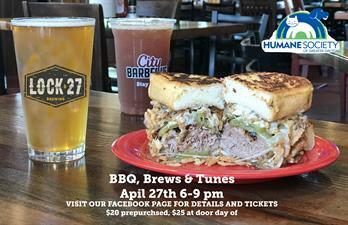 We've teamed up with Lock 27 Brewing for this summer BBQ & beer bash benefiting The Humane Society of Greater Dayton. A ticket will get you access to our BBQ buffet, beer tickets from Lock 27, live music & fun PLUS it's all for a great cause! Join us for the patio party of the year!